For years Tiger Woods dominated the sport of golf. But even in his heyday, Tiger never had a run like IDPA ace Robert Vogel, who has an IDPA unbeaten streak dating back to 2007. For the sixth straight year, Bob Vogel (the IDPA’s only three-division Distinguished Master), has claimed the title of IDPA “Top Gun” winning the Stock Service Pistol (SSP) division title at the 2012 IDPA National Championships. 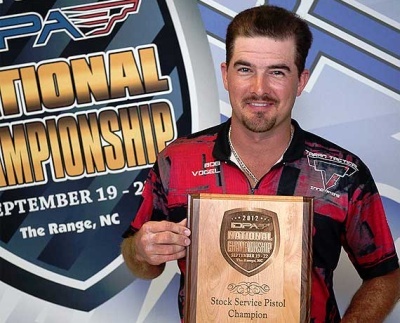 Vogel not only outgunned the entire field of 340+ shooters by 30 or more seconds this past weekend, but he also claimed the Most Accurate title to go along with his SSP win. Vogel finished the match with six stage wins and a time of 206.62 seconds with just 31 points down over sixteen extremely challenging shooting stages. “The course design at the 2012 IDPA Nationals was technically very difficult and presented a serious challenge for even the most accurate of shooters”, said Joyce Wilson, IDPA Exec. Director. There were many other impressive performances at the 2012 IDPA. Matthew Mink won the Enhanced Service Pistol (ESP) Division with a 238.93 (48), while Glenn Shelby took the Custom Defensive Pistol Division (CDP) title with a 248.48 (44) score. Team Comp-Tac’s Randi Rogers once again won High Lady, shooting 301.99 (114). Scott Warren earned High Senior honors with a strong 264.96 (79) performance. The 2012 IDPA National Championships took place September 19-22 in Oxford, North Carolina. Complete results from the 2012 IDPA Nationals are found on the IDPA website Match Page. To learn more about IDPA shooting, visit www.IDPA.com, read the DOWN ZERO Blog, or check for updates on the ShootIDPA Facebook Page. 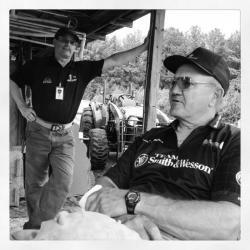 Share the post "Vogel and Miculek Win at 2012 IDPA Nationals"